When the magic of living in the giant interactive art exhibit that is New York City gets so overwhelming you can’t shrug it off with coffee or punk rope, you know it’s time for a change of scenery. Instead of getting lost in the transcendent beauty of other people’s Instagram feeds, discover where to go on your own architecture- and sculpture-dappled adventure this fall with this list of 10 inspiring (and seriously photogenic) places worthy of a day trip. This is what we talk about when we talk about #architectureporn. Considered to be the career-defining work of Philip Johnson (whose 1964 World’s Fair New York State Pavilion may one day become a cheeseburger museum or flower wedding chapel), the Glass House is a study in minimalist design, transparency, and reflection in nature. 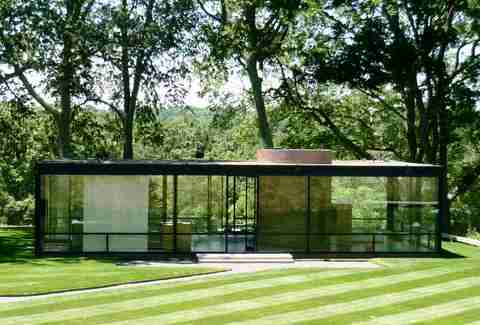 The very first Pritzker Architecture Prize recipient, who died in his sleep at the Glass House in 2005, Johnson built the structure in 1949, but the 49-acre retreat has since expanded to include 14 structures, such as Ghost House, Da Monsta, and the newly restored Sculpture Gallery, featuring pieces by Frank Stella and Robert Rauschenberg. The latest landscape installation, Yayoi Kusama: Narcissus Garden, invites visitors to meditate before a pond of 1,300 floating steel balls. 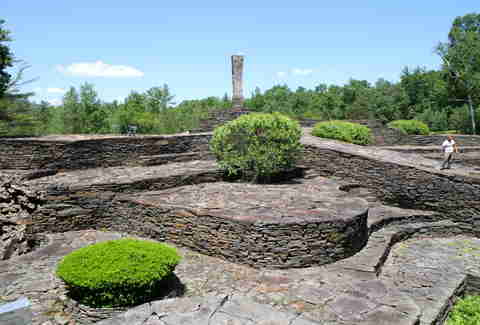 Tours are offered through November 30th and range from a one-hour house tour ($25) to a three-hour private tour ($250). Distance from NYC: 64 miles; Book the Metro-North package, which includes admission and round-trip transportation to Beacon station in 1.5 hours. Even if it wasn’t in a cool riverside town, Dia:Beacon would be a day well spent. Grab coffee and homemade cider donuts at Bank Square Coffeehouse on Main St, stretch your legs on Mount Beacon Trail (one of the best Metro-North-accessible hikes in New York), then take a free tour (every Saturday and Sunday at 1pm) of the museum’s celebrated collection, housed inside a 300,000sqft former Nabisco plant. From Sol LeWitt’s conceptual art to a new minimalist exhibit by Robert Morris to Dan Flavin’s phenomenological light works, Dia:Beacon’s space is less about understanding the art and more about feeling it (often literally, when you can’t help but run your hands around the ribbons of steel in Richard Serra’s behemoth sculptures). The dream house of renowned self-taught Hudson River School landscape painter Frederic Church could inspire a Tim Burton movie (although it’s already a dead ringer for the set of his Miss Peregrine's Home for Peculiar Children). “He was the original fauxhemian. He was interdisciplinary before the word existed,” says Adam Rolston, architect at INC and designer of your next getaway in the woods. “The world he created in his home aesthetically captures all the exoticism of the first world travelers of the 19th century.” Guests can roam the lush grounds of this 250-acre hilltop estate for free, taking in the stone-, brick-, and polychrome-stenciled mansion -- envisioned with Central Park co-designer Calvert Vaux -- that overlooks uninterrupted 360-degree views of the Hudson River and Catskill Mountains. 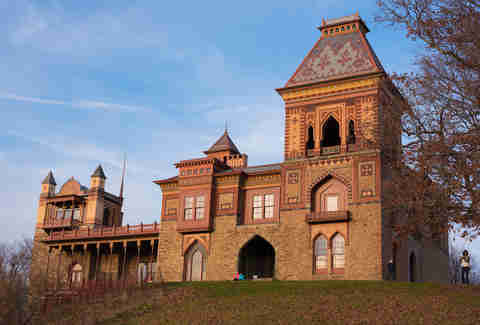 Up-close access to the 146-year-old National Historic Landmark’s contrasting Moorish-Italianate-Victorian-Middle Eastern structure could justify making the trip, but it’s worth shelling out $25 to step inside Olana for a glimpse at perfectly intact rooms, exhibits, and even better panoramas from the bell tower. 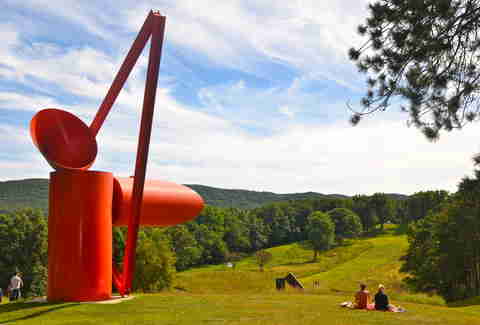 Flanked by wildflowers and Roy Lichtenstein installations in a 14-acre meadow off Montauk Hwy, the Parrish Art Museum’s innovative two-winged structure is like a permanent exhibit. Before viewing what’s inside on the walls, patrons are drawn to the long concrete bench to dwell on linear beauty and landscapes -- or, you know, just take selfies. Equally as inspiring as the modern barn complex is the collection of more than 2,600 works of American art and rotating shows, like Unfinished Business: Paintings from the 1970s and 1980s by Ross Bleckner, Eric Fischl, and David Salle and the upcoming Artists Choose Artists, celebrating local talents from the East End. This eco-outdoor sculpture sanctuary is where you might imagine Bernie Sanders retiring. 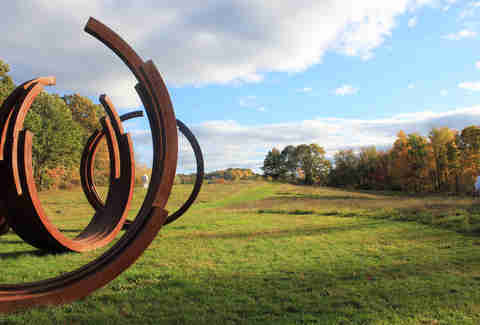 A progressive 60-acre playground that fuses natural and architectural elements, the Fields Sculpture Park is an under-the-radar escape for overworked New Yorkers who come by word-of-mouth to slow down, take a nap in DeWitt Godfrey's steel hoops, and simply feel free (and maybe even momentarily forget to check their email). Distance from NYC: 23 miles; take NJ Transit to Ridgewood, then walk 10 minutes to the center. If you need an excuse to visit Ridgewood, New Jersey other than the plate of truffled cacio e pepe spaghetti at From Scratch, this is it. Built in 1953, the former home of maverick landscape architect James Rose is an overlooked gem that melds ancient East and modern West sensibilities and pays homage to the ever-evolving state of the natural world (in other words, there are trees penetrating the house). A travel-worthy treat for interior design lovers and tenants of cluttered apartments, the James Rose Center will awaken your inner green thumb -- even if that means cultivating a wild garden on your fire escape. Distance from NYC: 60 miles; drive one hour or book the Coach USA package ($47), which includes admission and round-trip transportation. 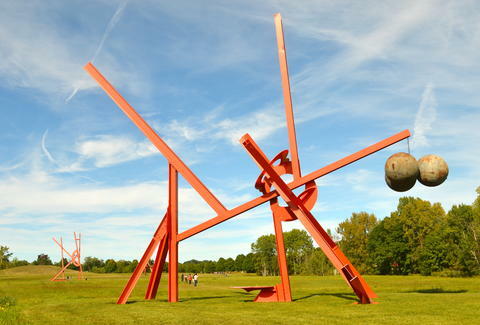 There’s no such thing as too many visits to Storm King Art Center, a 500-acre retreat for getting totally blissed out. Over 100 architectural treasures are spread across the bikeable hills, fields, and woodlands, where large-scale, site-specific installations like the new Outlooks: Josephine Halvorson are inspired by the rhythm of maple trees. If you want peace of mind, come and get it. Distance from NYC: Take the Navy Yard Loop Shuttle from Center City or the AT&T Station. From its 17th-century roots as the first American city designed on a grid to its current museum boom and public space revival, Philadelphia has established itself as an aesthetically rewarding haven for architecture wonks, art enthusiasts, and anyone who appreciates ingenuity -- that, and butter pecan goodness at Federal Donuts. Among Philly’s prides and joys, like Magic Gardens, the Mural Arts program, the Barnes Foundation, the Singh Center for Nanotechnology, and Lord Norman Foster's upcoming Comcast Innovation and Technology Center, the Navy Yard is perhaps the best example of a city on the forefront of design innovation. 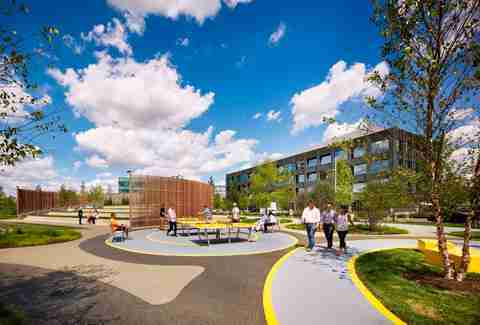 Enjoy a two-hour tour of this visionary ecological urban redevelopment project that houses 152 companies, residential units, turn-of-the-20th-century historic buildings, navy warships, a glass acropolis, and a 4.5-acre green space created by the designers of the High Line. After about a minute at Grace Farms, you’ll wish you could move in. Though it’s (probably?) not legal, the good news is admission is free, so you can come back as much as you want to enjoy what feels like a mini vacation or the best offsite workspace ever invented. Set on an 80-acre preserve, this multifaceted facility is all about exploration -- of nature, the arts, faith, justice (check out the Justice Bar in the library) and, perhaps only unwittingly, yourself. Whether you read in the Tea Pavilion, eat a grilled cheese in the Commons, or play a game of pickup in the subterranean basketball court, consider also booking the Fall Foliage tour or River Walk and Tea excursion to get a more in-depth look at the buildings, designed by Pritzker Prize-winning architects, and diverse natural habitat strewn with site-specific installations by renowned artists like Olafur Eliasson. Lauren Matison is a travel writer and co-founder of offMetro.com who is really behind posting these day trips on her instagram #becausebaby (but secretly loves the excuse).